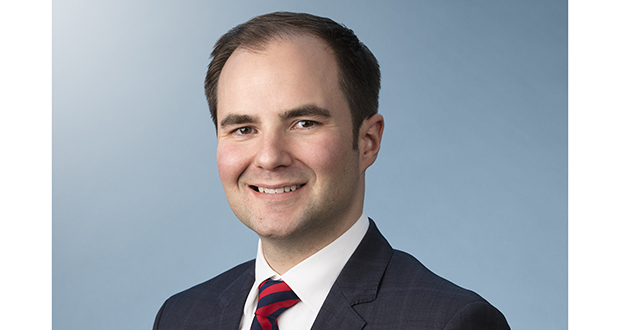 Andrew Murphy, partner at Faegre Baker Daniels, says his desire to “turn over every rock” drives his pursuit of high-stakes, often years-long class-action cases. Collaborating with clients over time to devise a long-term strategy adds to the appeal of his work, Murphy said. A. Two things I love are history and travel. If you mention something combining the two like visiting a historical site or a battlefield or a president’s house, I’m hooked. A. Being a lawyer is the only thing that I ever seriously considered doing. When I was a teenager I competed in extemporaneous speech competitions. After one competition a judge said that I sounded like a lawyer. That sent me on a trajectory that I’ve been on to this day. A. “The Guns of August” by Barbara Tuchman. It’s my favorite example of the power of an introduction to seize a reader’s attention. I always have a few books about space and physics floating about. A. My biggest pet peeve is responsive arguments that do not actually respond to the argument being advanced. They make cases more complicated and cause everyone to spin their wheels over things that don’t matter. A. I love working on cases that present novel issues of law. I particularly enjoy working with a big team of people to come up with new arguments. A. Sometimes we’re too quick to impute motives to our adversaries. Most people are trying to do what they think is right under the law and in the best interests of their clients. We do a pretty good job of recognizing that in Minnesota, but that’s not the case everywhere. A. Building and flying model rockets with my kids. I love my kids’ excitement during the countdowns and their enthusiasm as they run and try to catch the rocket, usually without success, as it parachutes to the ground. A. I grew up in St. Cloud and would take them to see Munsinger Gardens, where you can see just about every type of flower that will grow in Minnesota and walk along the Mississippi River. The most scenic and peaceful place in the city. A. [Faegre counsel] Lucetta Pope, the clearest thinker and best writer with whom I’ve worked; more than anyone else she taught me how to think like a lawyer. [Faegre senior counsel] George Stohner, a longtime mentor. Every day he reminds me of the value of friendship, loyalty and tenacity. Q. What, if any, is your favorite depiction of the legal professional in popular culture? A. My historical hero is John Adams. There’s a great episode in the HBO “John Adams” miniseries that focuses on Adams’ defense of the British soldiers involved in the Boston Massacre. It’s a wonderful example of a lawyer standing up for the rule of law in the face of popular opposition.